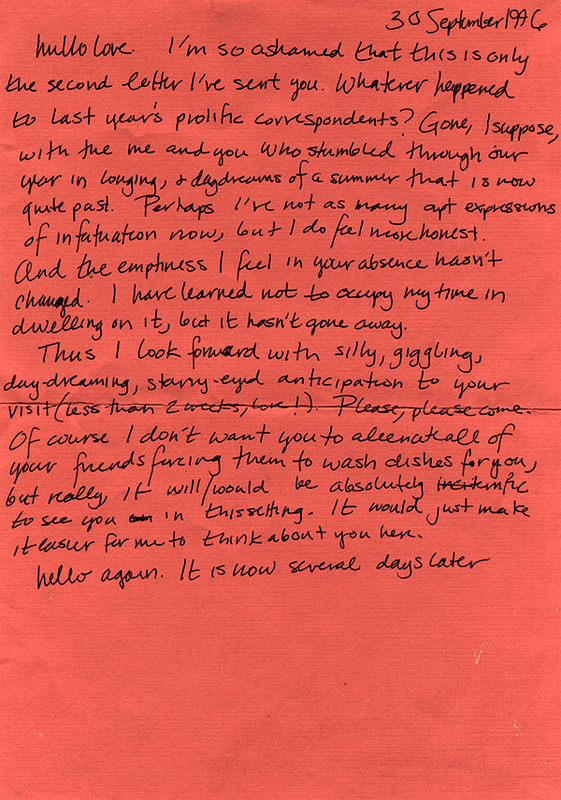 I found this love letter while I was in college and I’ve kept it for about ten years. When I found it I was already well rehearsed in love letters, having dated someone in New York for a year before moving out here from Wisconsin. We had a great time for a couple years and then moved on. Did she ever rewrite it? Was she writing for herself? Did her person visit? Who knows. Do you suppose she came to see him even without him having finished and sent the letter? Is the writer military or European? The format for the date seems to suggest one or the other. By the date format, handwriting, and use of certain turns of phrase such as “hullo” for Hello and “quite past”, I’d say yes, European. Wow! That looks exactly like MY handwriting! Did you find the letter in Wisconsin? I live in Wisconsin! I’ve started a multitude of letters expressing my yearnings myself. Don’t believe this could be mine, but wow, the handwriting is uncanny…. It’s funny…When I read it, it was a guy writing to a girl. Lovely, nonetheless. I don’t think he ever sent the letter…He continued another paragraph but never finished it. The most baffling aspect is: why would s/he alienate his/her friends by making them wash dishes?